дома » ARMENIAN - ENGLISH CONVERSATION GUIDE հայերեն անգլերեն զրուցարան » ՀԱՅԵՐԵՆ — ԱՆԳԼԵՐԵՆ ԶՐՈՒՑԱՐԱՆ: ԵՐԿՐՈՐԴ ՄԱՍ: 6. ԽԱՆՈՒԹՆԵՐ, ԳՆՈՒՄՆԵՐ. ՏՂԱՄԱՐԴՈՒ ՀԱԳՈՒՍՏԵՂԵՆ. Men’s Wear. Ներբեռնել լավ որակով ( PDF) 6. ԽԱՆՈՒԹՆԵՐ, ԳՆՈՒՄՆԵՐ. SHOPS. շոփս: ՏՂԱՄԱՐԴՈՒ ՀԱԳՈՒՍՏԵՂԵՆ. Men’s Wear. մէնզ ուէը: ( էջ 105-106). Ներեցեք, բայց սա իմ ուզածը չէ: Do you sell socks? It’s not to my liking. Բաճկոնակը մի քիչ նեղ է ինձ վրա: This is just the thing. I can’t find anything to suit me. Do \ look all right? Gjve me a size bigger. Այս գույնը ձեզ շատ կսազի: The dress is too loose. I think the coat is a bad fit. Previous post: ՀԱՅԵՐԵՆ — ԱՆԳԼԵՐԵՆ ԶՐՈՒՑԱՐԱՆ: ԵՐԿՐՈՐԴ ՄԱՍ: 6. ԽԱՆՈՒԹՆԵՐ, ԳՆՈՒՄՆԵՐ. ՄԻՐԳ, ԲԱՆՋԱՐԵՂԵՆ. GREENGROCERY. 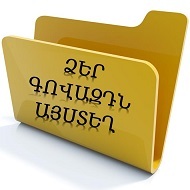 Next post: ՀԱՅԵՐԵՆ — ԱՆԳԼԵՐԵՆ ԶՐՈՒՑԱՐԱՆ: ԵՐՐՈՐԴ ՄԱՍ: ԳՈՐԾՈՒՂՈՒՄ: A BUSINESS TRIP.